There are two different types of camera in the world. There is DSLR and point and shoot also known as a compact camera. DSLRs are often known to be used by professional photographers because they require more skills to use. They are often the more expensive cameras as well. What is the Samsung NX30? We will be discussing a compact camera in this article. More specifically a Samsung NX30. Samsung is one the original companies in the camera manufacturing. They are also one of the most familiar brands that people can recognize. They are constantly evolving and this camera is no exception. It’s a pretty compact camera that gives high performance for a good value. It can work with most extreme shooting scenarios and subjects. You can do anything from lifestyle, portraits, travel photos, and action shots. This is great for someone who wants to do anything with their camera. There are no limitations with this camera. The NX30 uses 20 megapixels. Samsung designed the same CMOS sensor and Hybrid AF system as the compact, older Nx300. Though it puts it into an SLR style body, along with a built in electronic viewfinder and generous hand grip. When you buy it, you also get an AC adapter/USB cable for charging the battery in camera. There are straps and caps, a very basic 40-page Quick Start Guide, a foldout Quick Reference Guide, and two CDs. One has Samsung software and full instruction manual. The second has Adobe Lightroom Version 5.0, which is great because the program costs $149. The full manual has a basic guide to photography. This is great for anyone to look at, no matter what their experience level is. It’s clear, concise, and well-illustrated. So, you should have no problems understanding it. Samsung covers this camera with a 1-year warranty. It works like any other point and shoot camera. If you aren’t familiar with this type of camera, here is a quick explanation. In a point and shoot camera, the viewfinder is a simple window through the body of the camera. You don’t see real image formed by the camera lens but you get an idea of what is in the view. They also have a fixed lens camera, meaning you can’t change lenses like you can with a DSLR. The lens is built right into the camera body. Point and shoot cameras are fully automatic, meaning that you don’t have to fiddle with the controls. You can quite literally, point and shoot. This is why many beginning photographers start with this style of camera. While this camera may work like other point and shoot cameras, there are things that make this camera stand out from the rest. It’s taller and wider while still remaining lightweight. This makes it easy to carry around and use it during action shots. It’s also more comfortable to hold thanks to the grip and thumb rest on the rear. It has a pull out, tilting electronic viewfinder. To tilt it, you need to pull it away from the camera body. When you do that, the viewfinder can tilt upwards as far as 80 degrees. It has 2.36 million dots. Samsung is the pioneer of WiFi enabled cameras, and its smart camera lineup is now in its third generation. If you are using a compatible smartphone you will be able to take advantage of the Nx30’s NFC feature. It allows you to tap the devices together to share photos. The Remote Viewfinder Pro app offers further control over exposure and camera settings. It has the standard settings and controls in range of the camera. There’s the traditional four-way control button with the rear dial around it, plus buttons for exposure compensation, AE lock, menu function, playback, and deleting photos. It also has two custom modes, a SMART mode which contains the usual scenes like portrait landscape, and panorama. Then there is also a separate WiFi mode. Speaking of WiFi, there is now a dedicated WiFi button near the shutter button, Pressing the button will engage one of eight WiFi functions as assign in the Key Mapping section of Custom menu. Here we are going to break down the technical specs of this camera. This is so you can compare to others and see how you like it. Don’t feel bad if you don’t understand what any of this means, most of it is talked about within this review. This camera is on the more expensive side, but it does include Adobe Lighthouse 5.0. It seems that this camera is only available on Amazon. Best Buy had a listing for it but now it’s no longer available. Many people balk at the price of this camera, and we can’t blame them. While Samsung is a trusted brand for its quality, but it’s still a steep price to pay. This isn’t the only the only camera out there. The camera world seems to widening every day. It seems like there are more brands, style of cameras, and accessories appearing. It’s easy to get overwhelmed. A popular alternative to the Nx30 is Sony’s A6000. An automatic positive difference is the price. It’s fairly easy to use, but there are a few things that can be difficult. One is setting the AF point can just be too much hard work. It can slow the process of taking a picture. It gets a 4 out of 5 stars for how easy it is to use. It’s well built and designed. It’s sleek and light without sacrificing any controls. It gets a 4 out of 10 for build quality. It also comes with a yearlong warranty, which pretty standard, so 5 stars. Overall, we would give this camera a 4.5-star rating. Another great alternative is the Olympus OM-D E-M10, which is $648 on Amazon. It has similar features to the other two and is an entry level camera. This means that it’s easy to use. So, it gets a 5 out of 5 stars for ease of use. The design is lightweight and small. Even though it’s small, it still has plenty of controls that can help you take the perfect shot. It also has a view screen and a touch screen, which is rare with a camera that’s on the smaller side. We’ll give it a 4 out of 5 stars because it could be too small for photographers with large hands. The design is compact and it still has all the standards. A downside to its design is that it’s not weather proof. This really shrinks down where and when you can use this camera. It also doesn’t have an accessory port, and those are really must haves. We’ll give the design 3 out of 5 stars. We think this is a great camera for anyone who is getting serious about photography. We say this because while it’s an easy to use camera, you would not want to spend that amount of money for something you do as a hobby. This is a real investment. It’s lightweight and comfortable to hold. This should allow you hours of shooting time. The high resolution will create clear and beautiful images. The use of WiFi is a special highlight. Having the button right on the camera will make it easy to share photos and make sure that they are somewhere safe. This is something vital in our new post social media world. If you are on more of a budget, there are many cameras that have similar features to this one. The difference is that they are a lot cheaper. If you are looking for a simpler camera, you should definitely look elsewhere. 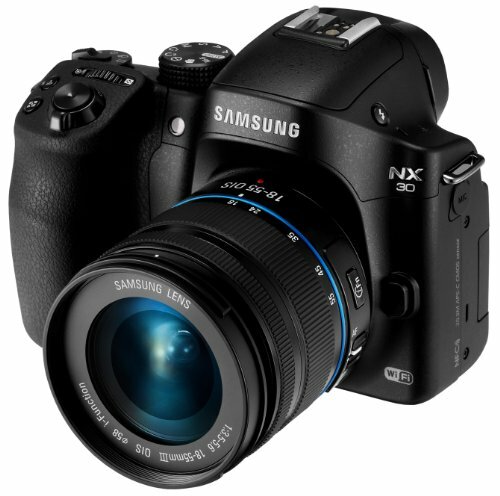 Overall, we would give the Samsung NX30 4 out of 5 stars.